Things are slowly returning to normal in the area of the library's 4th floor near the source of a roof leak that occurred a little over a month ago in the northeast corner of the building. The area has long since been dried and some 30,000 dry books that were removed from lower shelves there have been reshelved. The books were initially moved, in no particular order, on about 60 book carts, to the library basement. They needed sorting before they could be moved back upstairs to shelves covered by plastic sheets from the construction overhead in that area of the building. The reshelving process took just eight days and was accomplished by a small team of staff diverted from the Tulane Legacy Collection Analysis Project, which is identifying, examining for condition, and physically flagging the library's pre-1938 books stored off site, books that will eventually be among those housed in a new rare books area on a new 6th floor. The reshelvers--principally Kelsey Chapman, Katelyn Howells, and Izzy Oneiric--are employees of the library services firm LAC Group. 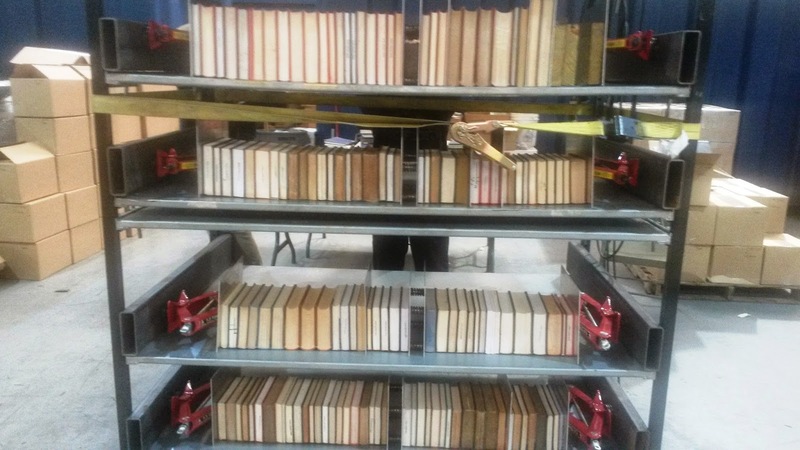 Meanwhile, the 2,200 wet books that were boxed, frozen, and shipped off to a restoration facility in Fort Worth, TX, are now on their way home. Samples sent in advance have looked good. The restored books will arrive first at our Recovery Center, still in operation after Hurricane Katrina, and they should be back on the shelves at Howard-Tilton in a few weeks. A relatively small number of titles will need to be replaced, but we know exactly which ones and replacements are expected to be ordered soon now that initial discussions of insurance have concluded. In the 4th floor open stacks area, workers removed all the ceiling tiles and have been installing sprinkler pipe, roof drains, and, over the book stacks, motion sensors that will turn lights off and on in the aisles between each range. The sensors will dole out energy for lighting based on use of the aisles rather than simply leaving the lights on 24/7. Lights in broader access aisles or seating areas will have standard illumination. The ceiling work is expected to be completed in this area by the end of this week or early next, after which the plastic sheeting now covering the book shelves there will be removed. 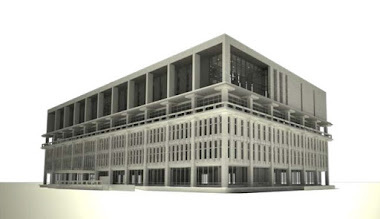 Next, the same work will be repeated in an adjacent quadrant of the 4th floor and eventually will move sequentially throughout the building, although more limited in scope on the lower floors. The contractor has completed the forms for the shear wall slab being built in the central stairwell and has poured concrete for about half the slab, with the rest to be completed this week. Nearby, another crew is removing walls between the men's restroom and the building's central chase to soon begin to build forms for a final shear wall there. Roof work has continued to remove a layer of rooftop“membrane” from a ten-foot wide swath around the roof perimeter. Workers are almost completely around the perimeter at this point and, basically, they have peeled the membrane back to where they are already constructing the base of what will be the outer wall of the library's new 5th and 6th floors. Steel for those floors should begin to arrive onsite very soon and erection of the steel frame will likely be accomplished in a concentrated and tightly phased time frame of about eight weeks. 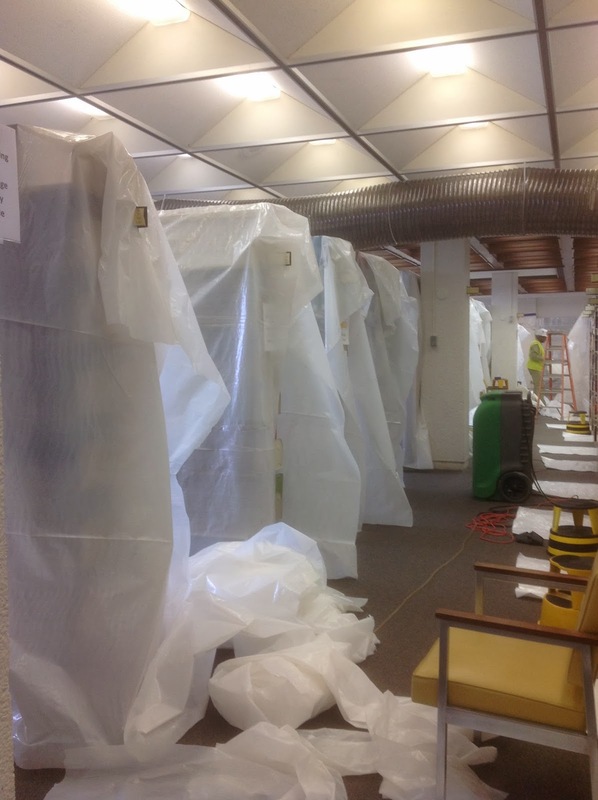 The contractor for the construction project has begun covering the book shelves in the 4th floor open stacks area with plastic sheeting in preparation for removing the ceiling tiles there to dismantle roof drains and perform other tasks in the space between the ceiling grid and the roof above. Removing the tiles will also make it easier to completely inspect the underside of the roof around the area where we experienced a major roof leak on February 21. The books will be covered and access will be restricted in this area until March 28. Books affected are those with call numbers A-DA. Until then library users will be able to check out books housed there by using the "Make a Request" feature in the online library catalog, with the standard 24-hour (weekdays) turnaround provided for access to materials in other restricted areas such as our off-site facility. These requests can also be made directly, in-person, at the Circulation Desk in the Learning Commons on the library's 1st floor. Access to the covered books will be restricted to library staff. Project managers initially thought that only a few ranges would be covered at the same time in the area, but they say the direction of some of drain pipes running across the width of the building made covering most of the ranges in the area more prudent. The contractor is required to preserve an aisle though this area all times for both staff and library users to continue to have access to the stairway on the Dixon side of the building. The stairway access aisle will be identified with caution tape. Meanwhile, in recovering from the roof leak we will move forward with plans to contract with outside help to reshelve the dry books from this area that are presented stored on carts in the basement, and will be working with the contractor to make access to the shelves for those books as easily accessible as possible for the reshelving process.